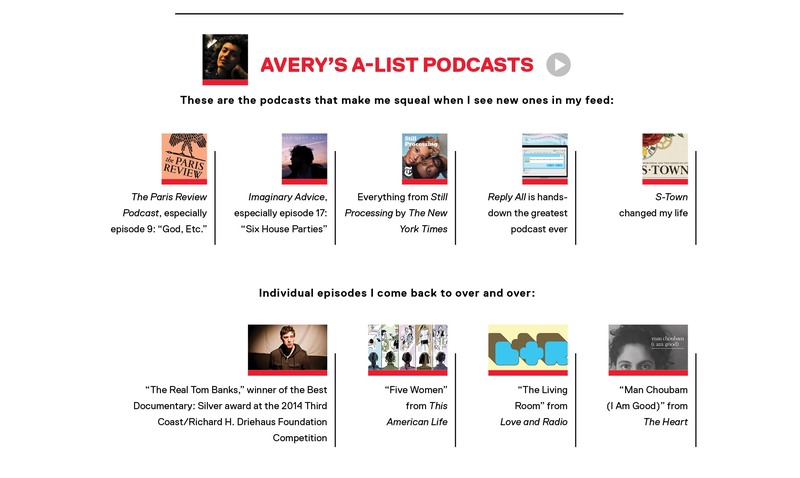 Avery Trufelman ’13 knows how to get inside your head: she goes through your ears. Though she double-majored in the College of Letters and German studies at Wesleyan, it was a combination of late-night exploits and luck that led Trufelman to her current vocation. She discusses her transition from aspiring industrial designer to inspiring audio storyteller below. How did you come to Wesleyan? When I first started looking at colleges, I kept waiting for that feeling old men describe where they saw a woman across the bar and immediately said: “That’s my future wife.” I got exactly that feeling when I visited Wesleyan, like an old-timey love story. I even wrote a love letter for my application. Cringy in retrospect, but it worked. One of the reasons I fell so hard was the radio station, WESU 88.1 FM. I have many fond memories of waking up at 3 a.m. and trudging over to my shift. I also invited people who are still my radio heroes to this day to campus to give talks, like Ilya Marritz ’99 (WNYC) and Lynn Levy ’05 (Radiolab, Gimlet Media). When Lynn came to speak, she mentioned this podcast called Love and Radio and it opened my eyes to this whole world of weird things you can do outside of the radio clock, when you don’t have to obey FCC rules and time constraints. At the time, podcasting was very new and it felt very underground, and this whole close-knit community developed around it. How did you come to where you are now? After graduation, I applied to work for NPR four times and was finally hired because of the confluence of my radio knowledge and German studies, working at their only terrestrial station outside of the United States in Berlin. It turns out Germans like to practice their English by listening to the radio. Then another fellow alum sent me a listing for an internship at 99PI in California, which I never thought I’d get. The internship became a permanent position, and now it’s been five years. It was all quite serendipitous and a lot of it was thanks to people I met at Wesleyan. A great combination of chance and fate. Design is defined as something intended to accomplish goals. What kind of goals do you have for your work and yourself as a person? How do you design your life? My parents met working at WNYC and so we were always kind of a radio family. The radio was always on. In terms of design, I can remember going to the Cooper Hewitt Museum when I was a kid, where they were displaying these brilliant little inventions designers had used to improve safety and comfort for people all over the world (like a water jug that could be rolled instead of carried on your head). That combination of creating and helping people intrigued me. Then I took a summer course at RISD in industrial design, and it turned out that I was bad at it. I didn’t have good vision. You have to have a certain degree of bravery to be a designer, and working from a blank sheet of paper was hard for me. But I did discover that I’m good at working within defined parameters and arranging in creative ways. For me, freedom comes from limits. Like I’d be bad at designing clothes, but I love to design outfits. I started thinking about my career in those terms and radio was a great fit. When you’re putting a story together, you start to see how everything connects to everything else. It’s one of the reasons that I love examining objects in the built environment—all these things, which will all outlive us, tell us so much about our priorities and the way we live in the present. One of my favorite stories is about fire escapes, which ends up being a story about human fear and predictability. I see it as very psychological, helping people find out about themselves and the way they interact with the world. In every story, I learn so much about myself and I hope to be able to do the same for others. In terms of the medium, my goal is to stretch podcasting in any way I can. It’s still in its adolescence and there’s so much untapped potential in audio. It helps to hear that podcasting seems to be part of a wider creative ecosystem. When people tell me they listen while painting or writing, it’s like providing soil for someone else’s plant. It’s the most beautiful thing. Any career or life advice to current students or fellow alumni? How do you know which meaningful risks are worth taking? Herman Hesse comes to mind, that notion Siddhartha has that he’s a stone falling through water toward his goal. I was initially rejected so many times in my career pursuits, and it felt stupid. It didn’t feel like taking a glorious risk. I felt like I was overindulging myself. But you try to abide and see where things take you. I remind myself all the time to make a plan, and then be prepared to abandon it. For example, whenever I’m about to interview someone, I read all their books. I write all these elaborate notes that I don’t end up using. But if you’re a knowledgeable person who’s prepared, then you can better embrace spontaneity. It’s the confidence that comes from that preparation that allows you to make the jump. I didn’t know podcasting was going to become a thing. I didn’t know I was going to move to California. But I had a bunch of things in my back pocket that coalesced. I was prepared somehow. And I also want to acknowledge the uniqueness of my circumstances and all the support I’ve received from my friends and family. A Special Guest: President Michael S. Roth ’78 is a noted Freud scholar and appeared on Episode 169 of 99PI, “Freud’s Couch,” to discuss how a single piece of furniture came to embody the famed psychoanalyst’s signature approach.